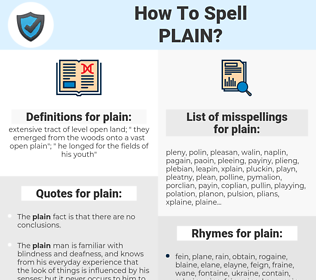 What are the misspellings for plain? 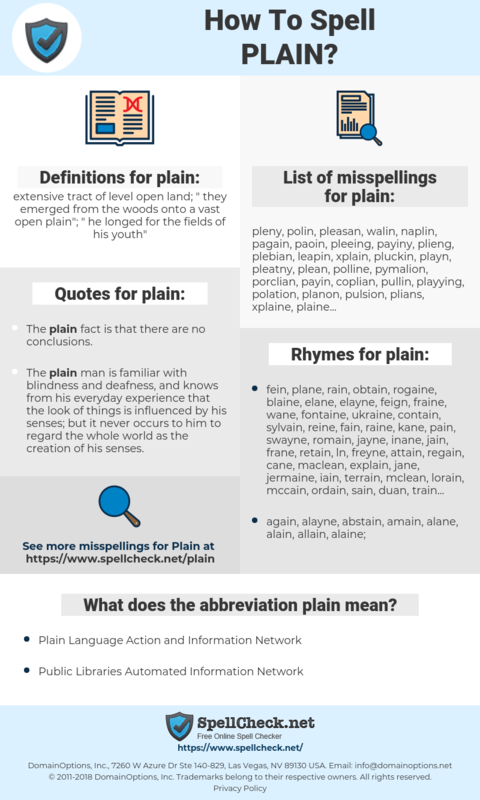 What are the common mistypes for plain? What does the abbreviation plain mean? What are the quotes for plain? What are the rhymes for plain? What are the translations for plain? What are the common typos for plain? This graph shows how "plain" have occurred between 1800 and 2008 in a corpus of English books. The plain fact is that there are no conclusions. 平原, 平地, 明了, 朴实, 简朴, 浅显, 原味, 平淡, 质朴, 纯素, 简单的. gewoon, effen, totaal, openhartig, sober, enkel, zuiver, puur, vlak, eenvoudig, duidelijk, klaar, vlakte, alledaags, volslagen, doodgewoon, ronduit. lisse, plat, clair, parfait, manifeste, net, simple, ordinaire, simples, franc, facile, sobre, quelconque, évidente. glatt, einfach, normal, vulgär, flach, eindeutig, Ebene, rein, deutlich, klar, offensichtlich, evident, ehrlich, brav, einfarbig, schlicht, leicht verständlich, unzweideutig, Flachland, flaches Land, pur, unkompliziert, uni, blanko, unifarben, unscheinbar, schmucklos, reizlos, unliniert, unattraktiv, ungemustert, schnörkellos, gutbürgerlich, simpel, hausbacken, halbbitter, unansehnlich, fade, Brut. 平原, プレーン, 無地, 素, 低地, 平易, 飾り気のない, 地味, さっぱり, 容易, 柔婉, 昭々, ていち, あきらか, まずい, 易しい, のづら, かざりけのない, はら, へいげん, の, 埜, めいはく, げんや, 野面, 歴歴, かんそ, 淡白, 淡淡, じみ, 端的, たんぱく, れきれき, たんてき, ひらち, あからさま, 昭昭, 小野, 易易, れきぜん, へいい, たんたん, そまつ, くだけた, 不味い, 平坦な. claro, comum, corrente, claras, raso, planície, singelo, direta, sóbrios, simplificada, inequívocos, genéricas, sem atrativos, plain. простой, обычный, ясный, равнина, обыкновенный. plano, corriente, completo, liso, aburrido, puro, llano, llanura, absolutamente, totalmente, sencillo, directo, franco, plena, modesto, claramente, manifiesto, natural, obvio, vega, explanada, campiña, planos.